Underground structures are often recorded incorrectly on plans with manhole positions providing no guarantee of the true centre line. This can lead to catastrophic mistakes based on inaccurate assumptions. Our specialist mapping solutions provide detailed and accurate survey data to facilitate build over consent and avoid costly delays. Excavations can often be seen as low risk and assumed to have no impact on subterranean infrastructure. 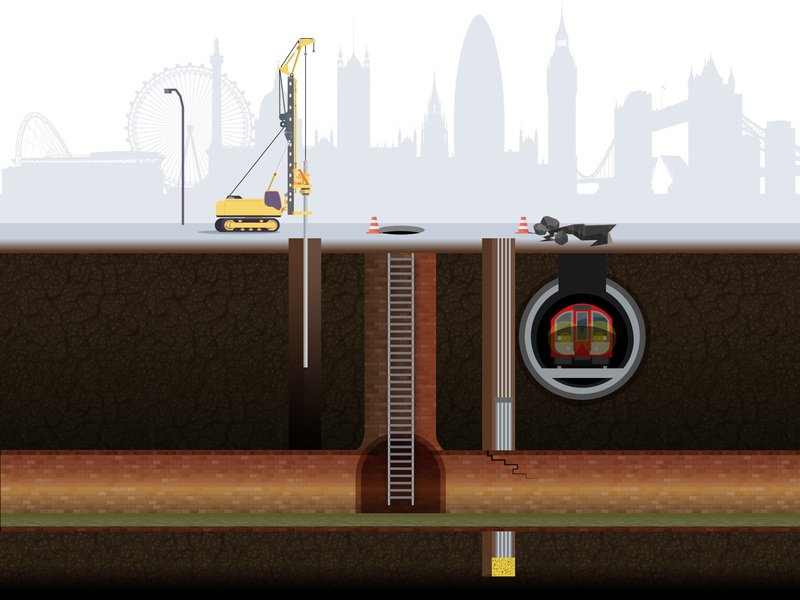 Utilities and transport networks such as London Underground and other access tunnels can be impacted by even the most routine site works. Infotec’s survey information facilitates safe excavation by defining precise working limits. Structural penetration can have a catastrophic effect on any project. Pile strikes to critical sewers and other subterranean infrastructure can be avoided with the provision of advanced mapping solutions provided by Infotec. Asset damage can occur indirectly and may not come to light until sometime later. Piles often pass close to major assets displacing surrounding sub-soil and applying detrimental loads onto the structure, resulting in a range of defects with potential for major consequences. Our 3d survey solutions facilitate safe, close proximity works. Obtaining build over consent for any project or development relies upon a robust and assured application. Infotec offer a range of solutions to best support your build over application and maximise your real estate potential. Our pioneering solutions include gyroscopically tracked in-pipe LIDAR and 3D infrastructure point cloud modelling which provide unparalleled accuracy without the requirement for manned entry. Infotec are multi award-winning survey experts and continually pioneer groundbreaking solutions within a challenging and unseen environment. Infotec Surveys were engaged to facilitate a build over redevelopment of one of London most prestigious landmark sites. Significant and critical Thames Water sewer and UKPN Cable Tunnels passing under the proposed prime residential development site, required precise positional information to prove the viability of the proposed project design. Infotec delivered full 3D infrastructure mapping data for the site using their remote survey capabilities. The site was subsequently purchased from Royal Mail and plans are now to extend the development with the purchase of adjacent sites already being considered. Contact us today to discuss your specific requirements. We'll send you detailed case study information. We'd like to occasionally send you communications via email to keep you up to date with the latest company information. Please confirm if you would like us to contact you by checking "Yes" below. You can unsubscribe at any time.